I can't believe it has been nearly 5 years since I started my Parcheesi quilt made with feedsack fabric. It is amazing to me how in that time frame I've not made a lot of progress. It started with 6" white squares and feedsack melon slices hand appliqued on the blocks. It has been a fun project to carry here and there and applique in short spaces of time. I pulled it out recently because I want to finish it this year. I appliqued a bit over the weekend and then decided to sew some of the squares together. I like scrappy blend of fabrics and the open space making 2 different designs. I really have a lot more appliqueing to do if I want to get a quilt out of this project this year. It is beautiful and deserves to be finished :) nice to have a project you can work on here and there! looks like a good project to work on during General Conference. I think I started one of these years ago, but who knows if I still have it in a box somewhere. Its fabulous in your vintage fabrics. What a lovely piece - enjoy the process rather than hurry it. I love those vintage feed sacks. You must have a pile of them. I have a posey applique quilt I need to begin finishing. I only have one square 3/4 of the way done. I started it in Bryce about 3-4 years ago. I love it. I have thought about making this one too. It is a great way to show off small pieces of fabric. This is going to be another one of your masterpieces! 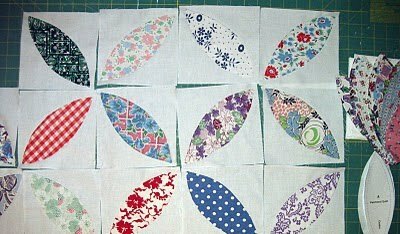 I love the scrappy fabrics - I made a quilt like this once, but not with scraps, and it's one of my favorites - all that applique will be worth it once it's done! Oh it's so beautiful !!! Ooo...I love this! I can imagine how pretty its going to be with all those little squares sewn together in a quilt. 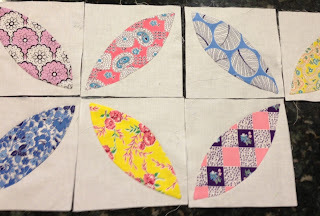 What a fun take along project...working with all those gorgeous fabrics. A Parcheesi quilt!! I have one (okay or two) quilts that have been hanging around for a few years waiting for me to finish them. There is one grandmothers flower garden in particular that I used to carry around and work on when I waiting for the kids at their activities and then they all got their licenses and my hand sewing time has plummeted. What size is your quilt going to be? That is going to be gorgeous! It is already. I love the feed sack prints. I had dresses out of those when I was a child. A Parcheesi quilt has been on my to-do list for far too long! Seeing this makes me really want to start one! Yours looks fantastic!! Keep plugging away at it and you will be finished in no time! 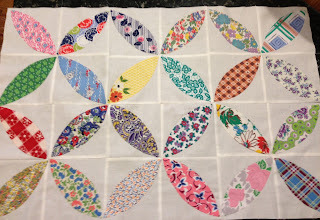 I love this block and want to make one too. Your fabrics are really going to make this a beauty! Long-term projects like this are like visiting old friends from time to time - and occasionally they hang around for a while. I'm feeling the love. Oh so gorgeous! Another quilt to add to my bucket list! This is a wonderful classical beauty! Your precious Feedsack fabrics must be feeling right at home in these Parcheesi petals. The white around them is perfect! Good luck with your goal of finishing this beauty this year! Need I say how much I love this? I think it's nice to have a project simmering over time, that you can really fuss over and do slowly. It's just beautiful. You inspire me. One by one you will get it done. I had not heard of that name Parcheesi before.. The blocks joined together look so beautiful. It looks so beautiful. 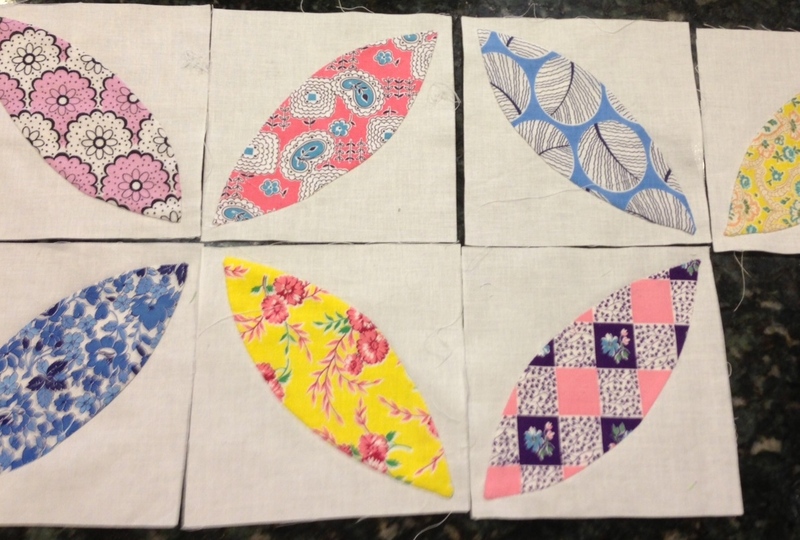 Sometimes when I get stuck on a project, I start sewing squares together like you did. Seeing the progress helps keep me motivated.